In recent times, the media has been swarmed with news around electric cars and the future of the diesel engine, so it’s tempting to think the internal combustion engine maybe on the way out. After all, more and more automotive manufacturers are promising to reduce emissions every year and potentially looking to go electric across their model line-up. Mazda has been looking at doing something different though, as in truth the internal combustion engine is going to power the vast amount of vehicles for at least the next 50 years. Mazda has realised this and has tasked its R&D department to improve the gasoline engine today to maximise benefits over the next half-century. Mazda’s fuel economy and emissions development program is called Sustainable Zoom-Zoom 2030, it’s declared to reduce complete “well-to-wheel” CO2 emissions to 50% of 2010 levels by 2030, and just 10% by 2050. Well-to-wheel is an important concept, as 40% of the world’s electricity is generated by burning coal. Coal contributed to 39% of global CO2­ emissions, according to National Geographic magazine. This means, it doesn’t matter if your electric car has no emissions if its power comes from a power plant burning coal. Furthermore, industry estimates that 84.4% of vehicles built from now until 2050 will have some kind of combustion engines, whether it’s the primary engine, part of a hybrid, or an EV range extender. Therefore, Mazda believes improving the efficiency of the gasoline engine is a vital step to reduce the total systemic emissions in the transportation sector. Mazda plans in the next decade to introduce new hybrids and electric vehicles, but they are also focusing on the combustion engine due to it taking a huge share of the vehicles sold in the industry. Mazda’s investment is to focus on new engine technology, chassis and transmission refinements that lead to less weight lower aerodynamic drag and reduce energy loss. The latest concept is the SKYACTIV-X engine, which focuses burning fuel in a totally different way. In a conventional gasoline engine, a spark plug ignites a mixture of fuel and air at the right moment, with the mixture compressed at the point of ignition. Diesel engines differ by have the air compressed very tightly and the fuel is introduced at the maximum point of compression. The diesel fuel ignites spontaneously without a spark plug. 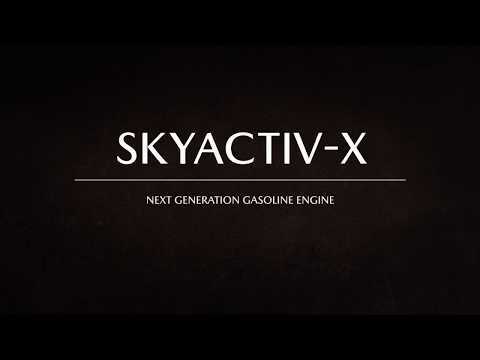 SKYACTIV-X uses this concept by having a high compression ratio similar to a diesel engine, but it’s not high enough to cause the gasoline to spontaneously ignite. This concept allows the SKYACTIV-X to burn considerably less fuel than a conventional gasoline engine, leading to lower CO2 emissions. Secondly, the ultra-high compression ration means more power is extracted in every stroke. Compression ignition was first invited by Rudolf Diesel in 1890, hence why the fuel bears his name. Mercedes-Benz and General Motors have both tried to use the technology, but challenges of operation under widely varying circumstance have been too great, which has stopped mass production. Mazda found the biggest challenge was controlling when the compressed ignition occurs and stopping a pre-ignition. Engine management technology improvements in the last few years has helped to aid Mazda’s discovery. Mazda plans to release the SKYACTIV-X engine in 2019, under the bonnet of the next-generation Mazda3. A prototype of the engine, is currently producing 170hp and 174 pound-feet of torque from a 2.0-litre engine, similar numbers to a 2.5-litree SKYACTIV-G engine.